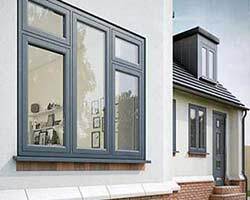 Contemporary style A Rated energy efficient grey window frames are based on Anthracite Grey RAL 7016 available with a grey woodgrain foil both sides or grey on the outside and white on the inside. Offering quality made to measure A Rated double glazed upvc windows and guaranteed low prices from just £72 inc VAT supply only. Buy hassle free online and direct from the UK's leading diy double glazing supplier - saving you £££'s! Foiled to mimic traditional timber meaning less frame and more visible glass. The appearance achieves a modern and contemporary energy efficient upvc window that fits the age and style of your property but eliminates the draft and costly up keep of wood with the benefits of low maintenance and excellent thermal properties. 10% off all orders over £200. Extensive range of made to measure double glazed upvc windows and external doors available to buy online with fast lead times. Made to measure A energy rated grey upvc window supplied with Pilkington K soft coat low E 28mm glass achieving a u value of 1.3 W/m² K. The 70mm thermal efficient multi-chamber frame system has ultra slim sightlines, clean and modern aesthetics.